Easy to grow and productive - a pound of cloves can produce 7 to 10 pounds of garlic - the “stinking rose” needs rich, well-drained soil, full sun and excellent weed control. Well-drained, fertile, with plenty of organic matter. Slightly dry sites preferable. Tolerates wide pH range but prefers slightly acid soil (6.2 to 6.8). Propagate by division or separation - Cloves must be exposed to temperatures below 65 F or they may fail to form bulbs when planted. Plants may produce flowers, but they are usually sterile. Garlic prefers cool weather when developing foliage, and warm weather when bulbs enlarge. Fall plantings take about 8 months to mature. Choose a weed-free, well-drained location. Raised beds are ideal. Do not plant where other onion family crops have been grown in the past 3 years. In New York, plant from about the time of first fall frost to early November. If your soil is loose and well-prepared, you can plant in very early spring, but fall plantings usually yield more. Using cloves from the supermarket is not recommended. They may carry diseases or have been treated to discourage sprouting. Most are also from varieties that are not well-adapted to New York's climate. Purchase bulbs from mail order suppliers, garden center, or other local source. Break bulbs apart at planting time, keeping papery husks on the individual cloves. Plant with tips up, 2 inches deep and 4 to 6 inches apart in rows 15 to 24 inches apart. 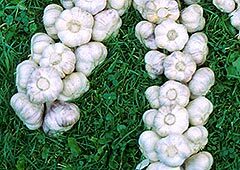 Plant elephant garlic varieties about 3 inches deep and 8 to 12 inches apart. Mulch heavily after planting to prevent soil heaving - particularly with less-hardy elephant garlic varieties. Roots will begin to grow even though topgrowth may not be evident in late fall and winter. Remove mulch in spring, leaving only what is needed to suppress weeds. For larger bulbs, remove woody flower stalks (scapes) as they appear. Bulblets at top of scape can be used in cooking. Plant large cloves to produce the largest bulbs. Plant smaller cloves at closer spacings or in patches for harvest as garlic greens. Save largest bulbs for planting your next crop. Expect few or no insect problems. Bulbs may rot in heavy, wet soils. Otherwise, few serious disease problems. Do not plant where other onion family crops have been grown in the past 3 years. 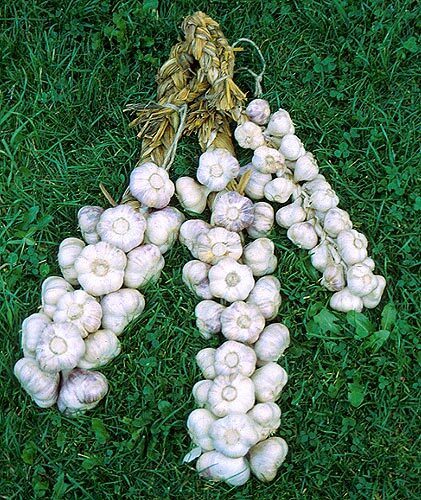 Browse garlic varieties at our Vegetable Varieties for Gardeners website. Softneck varieties (Allium sativum var. sativum): So called because their necks stay soft at harvest time, so they can be braided. Produces large cloves around the outside, and smaller cloves in the middle. Strong flavor. Stores well. Less winter-hardy than stiffnecked varieties. Varieties found in supermarkets are most often softnecks. Includes Silverskin and Artichoke types. Stiffneck varieties (Allium sativum var. ophioscorodon): A single ring of cloves surrounds a stiff central stem that curls as it grows. Most cold-hardy of the garlics, but doesn’t store as well as softnecks and has a milder flavor. Cloves are easy to peel. Includes Rocambole, Purple-Striped and Porcelain types. Elephant, or great-headed garlic (Allium ampeloprasum): Milder flavor, intermediate between garlic and onions. Larger bulb with fewer larger cloves (usually about four). More closely related to leeks than to A. sativum garlics, and not as hardy.